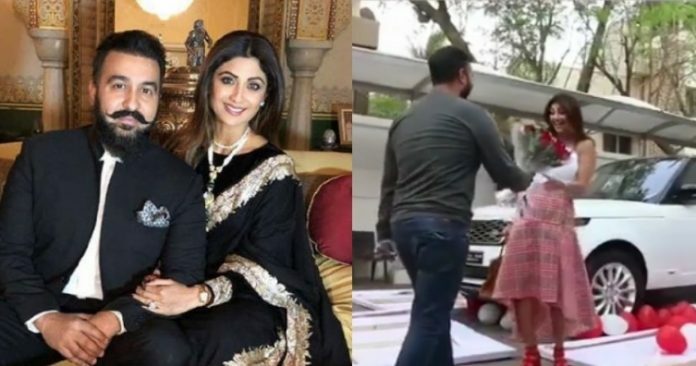 Home / Gossip / Raj Kundra / Shilpa Shetty / Raj Kundra gifts a Range Rover to Shilpa Shetty ahead of their wedding anniversary! Raj Kundra gifts a Range Rover to Shilpa Shetty ahead of their wedding anniversary! Bollywood actress Shilpa Shetty and her husband Raj Kundra is all set to complete nine years of togetherness on November 22. Well, ahead of their wedding anniversary, Raj Kundra gifts a Range Rover to Shilpa Shetty. The husband surprised wifey Shilpa by driving her to their Juhu residence after the Range Rover was delivered in a huge white box. And as soon as she opened it, some heart-shaped balloons surrounded her. In February 2009, Shetty began dating businessman Raj Kundra, with whom she was the co-owner of the Indian Premier League (IPL) cricket team Rajsthan Royals. The two married on 22 November 2009. The couple have a 6 years old son born in 2012. On the work front, Shilpa has featured in films like Baazigar, Dhadkan, Life In A… Metro and Apne. She is a yoga expert and is now also known for her famously indulgent weekend binge sessions – ‘Sunday Binge.’ Shilpa appears has also co-judged a couple of reality shows.